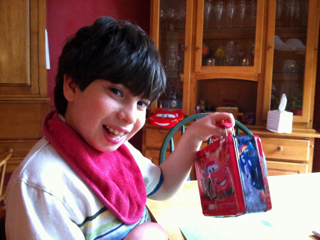 If your Cars 2 obsessed child happens to leave his Cars 2 lunch box at the bowling alley where he attended a birthday party over the weekend, and you are not able to pick it up till the following weekend, he will somehow survive. Somehow, I always forget that June is the most hectic month of the year, next to December. My brain just keeps thinking that it should be easy. 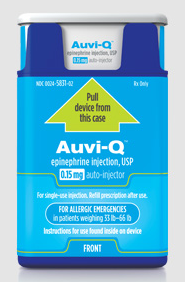 There's a new epinephrine injector, the Auvi-Q. It's a bit larger than a credit card and about 1/2 inch thick, so it's easy to tote around; it has voice instructions to guide you through the injection process; and it comes in kid and adult doses. Our pediatrician think it's going to put the Epi-pen out of business. I'm getting three of them, because I am extravagant that way! Er, I need one for home, one for school, one for the car/when we're out and about. I could easily spend the better part of my life browsing Houzz. At least I have plans for retirement. That old saying "Always get it in writing" is excellent advice. 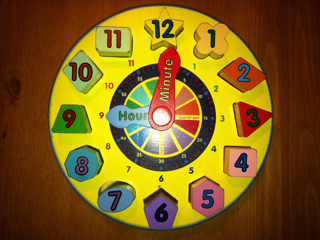 It's actually humanly possible to retain all of the pieces for a toy for 10 years. Is there an award for that? If it weren't for Guerlain Meteorites luminizing powder, some days people might not be sure I am still alive. If you are on the commuter train in the quiet car, where people aren't supposed to talk, and the guy sitting next to you is mumbling continuously as he works on his laptop and you say "Excuse me, this is the quiet car" and he says "But I'm talking to myself!" it's best to just move. If your 8-year-old has been asking for a year to get her ears pierced and you finally give in, you will no longer have any good threats left to make her clean her room or otherwise behave. But she will look very cute. If your child needs to bulk up, consider feeding him macaroni and cheese pie (what Max calls this recipe made from acorn squash). Max consumes vast quantities of it, and whereas at his annual checkup the doctor was concerned Max was maybe on the puny side, at a follow-up appointment four months later Max had gained TEN pounds and grew an inch and a half. Thank you, macaroni and cheese pie. It is not a good idea to DVR the season's first episode of True Blood and watch it right before you go to sleep. 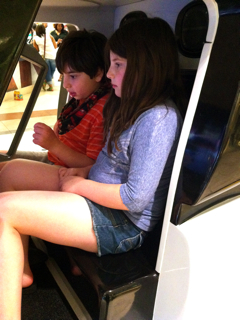 You're never too big of a kid to enjoy the rides at the mall. Love Auvi Q! I myself(a college student studying music therapy) am allergic to eggs, dairy, soy, and almonds. BTW Enjoy Life has chocolate bars that are free of all top 8 allergens, and gluten free. They taste like the real thing. 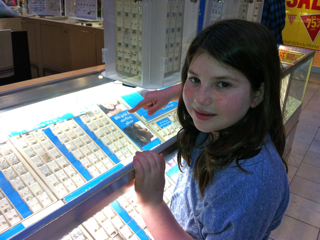 So you gave in and let Sabrina get her ears pierced! I was 13 before my dad let me. My cousin Kim has similar allergies and likes the Enjoy Life chocolate chips. One of my childcare girls has the Auvi Q... I've tried the demo/trainer and it's very very cool. I was super excited to get the Auvi-Q for my daughter, but turns out our insurance won't cover it. I think our out-of-pocket cost was going to be around $200 (I can't remember the exact figure) and I wanted two. Very disappointing. Is it really okay to keep the Auvi-Q in the car? It can get really hot in the summer, and I wonder what that does to the potency of the drug? I would check with the pharmacist to make sure it's okay before you rely on keeping one in the car, and also to make sure that you check the expiration date on it, so that when you DO need it, it will still be okay to use. I checked the website for Auvi-Q. It should definitely NOT be stored in your car. According to the website: It's sensitive to extreme temperatures. So, make sure to keep Auvi‑Q stored between 68°F to 77°F in general, and 59°F to 86°F in excursion. (Cars can go well over 100 degrees in the summer, and below freezing in the winter.) Additionally, Auvi‑Q should be not refrigerated. Before using, patients should check to make sure the solution is clear and colorless. If it's discolored, cloudy, or contains particles, Auvi‑Q should be replaced. Also, the epinephrine in Auvi‑Q should be good for approximately 1 year after the prescription is filled. So, periodically check it to make sure it hasn't expired. Paula, you're the best for looking this up! But, I already knew that. Thank you. Max loves his music therapy! I like the Auvi-Q it will help lots of people. Lots of valuable info in this post. And family updates as well. Thank you! Your daughter does look cute with her new earrings and you are right about the mall. Never to big for a ride. Thanks for today's smile. It's nice to know that there is always some new innovation out there just waiting for the human race to discover it.